GRAFOR, the new MetFlight graphical forecasting service, has been widely welcomed. At last, we have a good visual depiction of what’s likely to happen. This is infinitely preferable to pages of capitalised abbreviations, the result of a submissive CAA, Airways and MetService obeying ancient ICAO rules, and supported by elistist fogeys who always insisted that, to read the weather, you must learn their arcane language, written more than 50 years ago because of a shortage of paper and a reliance on agonisingly slow teleprinters. MetService has been touring the country to showcase its “products” for GA. We’d prefer to call them a “service” but they are a huge improvement on past offerings. 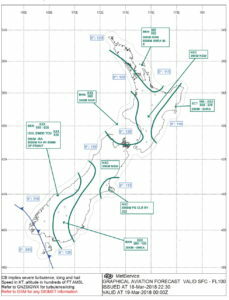 According to a MetService expert, when it was decided to totally redesign these forecasts, someone in the Civil Aviation Authority said that Radio-activity had to be retained. Of course, there is almost no chance of a radio-active cloud visiting our shores or being generated here. Therefore, should your MetFlight forecast ever feature an outbreak of radio-activity, you can expect aviation to be permanently terminated, along with everything else on the planet. Another archaic feature of the new-look format is times stated in UTC for low-level, VFR GA users. Anyone considering a flight knows that it is 0700 NZT. But the bureaucrats dictate that we must decode the forecast from the meantime near London to the actual time in New Zealand. To suggest that we adopt local time is certainly to flog a dead horse. But that doesn’t mean the use of UTC in New Zealand VFR GA is any less dumb.